Kalbi Korean BBQ Ribs, also known as Galbi, which is Korean for ribs, are a standard in Korean restaurants. Where most of us are familiar with braising short ribs cut with longer pieces of the bone, Kalbi are cut across the bones, or flanken-style, to a thickness of ⅜” to ½” thick. The short rib is a tougher cut of beef which is why they are tenderized in some way, like marinating for a longer time, or braised until tender. 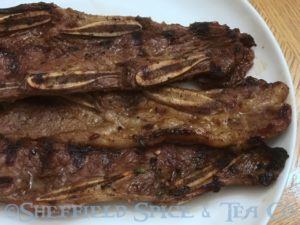 Kalbi, or Galbi are marinated then cooked for only a couple minutes per side. Korean BBQ Ribs use a sweeter marinating sauce which starts with Gochu or Gochugaru, the staple Korean Chile Pepper, along with brown sugar and Mirin, a sweet rice wine. We add some Maple Sugar for an extra complexity of flavor. We use the non-alcoholic version of Mirin found in the Asian aisle of the market. Soy Sauce or Tamari adds the umami flavor, and Asian pear adds the acid needed to help tenderize the ribs. The other ingredients add traditional flavors found in Kalbi and other Korean dishes. When served with steamed rice, Kalbi Korean BBQ Ribs make a complete meal. When cut into smaller pieces, they make a great appetizer of part of a larger selection of Korean foods. Rinse short ribs in cold water, pat dry. To help with tenderizing them, stretch them out a bit, lightly pound with a tenderizing mallet, or pierce with a fork. Any of these ways will help to tenderize the ribs while marinating. Place on a wide tray or large platter until needed. In a medium mixing bowl, combine the Soy Sauce or Tamari, mirin, water, toasted sesame oil and Korean BBQ Rub. Whisk well to combine and the brown and maple sugars to dissolve. Add the garlic, ginger, onion, green onions and Asian pear. Mix again. Transfer ribs to a large sealable freezer bag, or 2 if needed. You might have to cut the ribs into 2 pieces if they are too long to fit into the freezer bag. Add marinade, squeeze out excess air from bag(s), and seal. Turn the bag(s) over several times to ensure ribs are coated evenly. Refrigerate for at least 4 to 6 hours but preferably overnight. This helps to tenderize the ribs. Periodically turn over the freezer bag(s) to re-coat the ribs. Heat gas or charcoal grill to medium-hot. Pour off the excess marinade from the ribs. Grill the ribs about 2 to 3 minutes per side, turning once, to desired doneness. They should be slightly pink so they aren’t overcooked. They cook fairly fast. Watch so they don’t burn. Serve whole pieces with rice as a main course or cut into smaller pieces with kitchen shears to serve as an appetizer. To broil the ribs in the oven, set the oven to broil and preheat. Lay the ribs in a single layer on a broiling pan and place it on the top rack of the oven, about 6 inches below the broiler. Cook until the ribs are slightly charred and or about 4 to 5 minutes. Flip them over and cook for an additional 3 to 4 minutes. Watch so they don’t burn.